EWG scientists reviewed Biossance Squalane + Bamboo Deodorant for safety according to the methodology outlined in our Skin Deep Cosmetics Database. We assess the ingredients listed on the labels of personal care products based on data in toxicity and regulatory databases, government and health agency assessments and the open scientific literature. 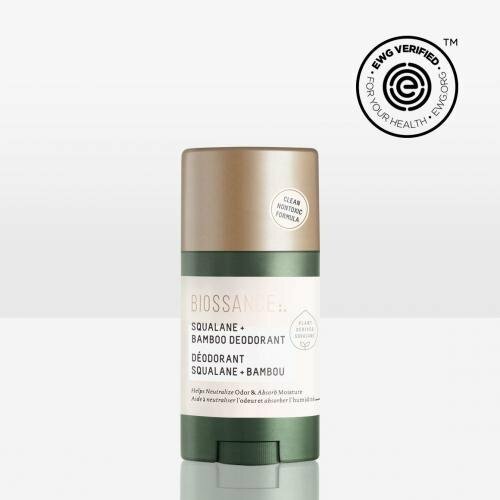 Biossance Squalane + Bamboo Deodorant is EWG VERIFIED™. Caprylic/Capric Triglyceride, Squalane, Stearyl Alcohol, C13-15 Alkane, Tapioca Starch, Hydrogenated Castor Oil, Bambusa Arundinacea Stem Extract, Triethyl Citrate, Jojoba Esters, Sodium Caproyl Lauroyl Lactylate, Glyceryl Caprylate, Glyceryl Undecylenate, Citrus Paradisi (Grapefruit) Peel Oil, Pelargonium Graveolens Oil, Salvia Sclarea (Clary) Oil, Bisabolol, Stearyl Glycyrrhetinate, Limonene, Citronellol, Linalool, Geraniol, Tocopherol. Apply to clean skin. Reapply as necessary.